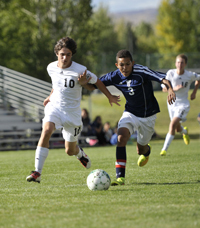 Firming up its defense and midfield control just at the right time, the Wood River High School boys’ varsity soccer team posted its second straight Great Basin Conference shutout with a 3-0 home win over the Twin Falls Bruins Thursday in Hailey. Wood River’s fourth shutout in 11 games avenged a 4-0 road loss at Twin Falls Sept. 9 and lifted the Hailey team (6-5-0, 4-3-0 league) past the Bruins (4-7-2, 3-4-0) in the race for the third spot in the six-team league. Junior Carlos Gonzalez made a crafty individual attack in the 10th minute—crossing into the middle of the field and firing a partially-screened shot into the right hand corner of the net for the eventual game-winning goal. Ahead 1-0 at half, Wood River struck early after half when Danny Graves made a nice through pass sending senior co-captain Sage Kelly in for his sixth goal of the season in the 46th minute. Senior goalkeeper Kyle Weller (7 saves) boomed one of his long goal kicks downfield that sophomore Alex Leon chased down on a big bounce and headed it home past the onrushing Bruins keeper in the 78th minute. Weller earned a rare keeper assist. Wood River, having allowed only two regulation goals in four games, visited Burley (2-8-0, 1-6-0) Tuesday and has a big home game against the Canyon Ridge Riverhawks (12-1-0, 6-1-0) on Thursday, Oct. 2 at 4:30 p.m. at South Valley Sports Complex soccer field. Canyon Ridge enters the game after its Tuesday home date with reigning state champion Jerome. Jerome (9-1-0, 6-1-0) visits Hailey Tuesday, Oct. 7 for Wolverine “Senior Night” festivities at 6:30 p.m. under the lights at Phil Homer Stadium football field. It’s a rematch of last year’s State 4A tournament title game. Jerome won this season’s first meeting 1-1 (5-4 shootout) Sept. 18. The Twin Falls Bruins (10-3-0, 6-1-0) surged into the Great Basin Conference lead with a 3-1 home win over Wood River Thursday. Samantha Sutton (penalty kick) had the lone Wolverine goal as the teams squared their season series at one win apiece. Wood River (8-3-0, 5-2-0) saluted its nine seniors Tuesday with “Senior Night” against the visiting Burley Bobcats (6-6-0, 3-4-0). Coach Doug Stouffer’s Hailey girls finish their regular season Thursday, Oct. 2 at Canyon Ridge and Oct. 7 at Jerome. Thursday’s game with Canyon Ridge (7-6-1, 5-2-0) will likely settle second place in the league—Wood River trying to improve on its 3-2-0 road record and even the season series with the Riverhawks. Canyon Ridge won a penalty kick shootout 1-1 (4-3) over Wood River Sept. 16.